Hailed as "epic fantasy on a George R. R. Martin scale, but on speed" (Fixed on Fantasy), the Broken Empire trilogy introduced a bold new world of dark fantasy with the story of Jorg Ancrath' s devastating rise to power. Now, Mark Lawrence returns to the Broken Empire with the tale of a less ambitious prince. The Red Queen is old but the kings of the Broken Empire dread her like no other. For all her reign, she has fought the long war, contested in secret, against the powers that stand behind nations, for higher stakes than land or gold. Her greatest weapon is The Silent Sister - unseen by most and unspoken of by all. The Red Queen's grandson, Prince Jalan Kendeth - drinker, gambler, seducer of women - is one who can see The Silent Sister. Tenth in line for the throne and content with his role as a minor royal, he pretends that the hideous crone is not there. But war is coming. Witnesses claim an undead army is on the march, and the Red Queen has called on her family to defend the realm. Jal thinks it' s all a rumor - nothing that will affect him - but he is wrong. After escaping a death trap set by the Silent Sister, Jal finds his fate magically intertwined with a fierce Norse warrior. As the two undertake a journey across the Empire to undo the spell, encountering grave dangers, willing women, and an upstart prince named Jorg Ancrath along the way, Jalan gradually catches a glimmer of the truth: He and the Norseman are but pieces in a game, part of a series of moves in the long war - and the Red Queen controls the board. this book surprised me, I'd never heard of it before and thought I'd give it a go. it was good, not exactly what I expected but I enjoyed it! I'm in love with Mark Lawrence's writing and his story telling. I'm looking forward to reading more. Tim's voice for this story is perfect. This book really takes a long time to get rolling. The story is pretty standard fare for fantasy novels and other than some names tossed around it doesn't really make a solid connection to the first trilogy. I was hoping to hear of builder ruins and technology or maybe more background on what went wrong to make their society collapse. Oh well. An entertaining story about a scoundrel brought kicking and screaming to his heroic destiny. Looking forward to the sequel. This book has many things to like about it and some not to like, which might very well be appropriate since the story revolves around the combination of opposites. There are two main characters in this one - Prince Jalan Kendeth, a womanizer and self proclaimed coward, and Snorri, a Viking warrior out for revenge against those who attacked his homeland. One strong and the other weak, they form an odd couple dynamic as fate thrusts them together and sends them out on a suicide mission. As in the Broken Empire series, Mark Lawrence starts by presenting us with an anti-hero in Jalan. Jalan is infinitely more likeable than Jorg but I still never found myself getting behind the "coward that gets lucky and is considered a hero" storyline. Snorri on the other hand was a likeable character and carried the day for me. I wound up liking the book and looking forward to the next one simply because of Snorri and his overall quest for revenge. Since this is the same world as Broken Empire there remains a bigger game being played here by powerful background figures and our two main characters are just pawns in that larger game. Jalan and Snorri are manipulated by a spell cast by the Silent Sister and find that in order to remove the spell they must carry out its purpose. The Silent Sister being one of those powerful beings manipulating the world from within the shadows with her true motivations unknown. Despite the Broken Empire tie-ins it is not necessary to have read that series first as this stands alone nicely. This is not as dark as Broken Empire and the lead character is a more likable anti-hero so this series will likely appeal to more listeners. Tim Gerard Reynolds is as good as they get when it comes to narrators and he is excellent as usual. This book is worth picking up simply for his performance. M. Lawrence does it again, but differently. In the Prince of Thorn's (POT) series, readers (whether you liked the book or not) were fascinated by a protagonist that most people did not really feel ok about liking. The character drove that book and the same happens in this book, but with an exception. The characteristics of this protagonist drives this book, but the writer did not try to make him another POT, but rather created a totally different personality that made me laugh many times throughout the book. I actually liked this book better than the POT. A tale of a cowardly prince and reckless viking. Boiled down, this is a tale of a prince and a viking who travel on a quest to both rid themselves of a bizarre curse and to save what remains of the viking's family. It's a rather simplistic story with most of it's staying power coming from the strength of it's main characters' personalities and the contrast between them. The humorously cowardly prince, Jalan, and the recklessly brave viking, Snorri, are two flawed characters who are completely different to the point of being polar opposites, yet work together effectively because of it. It's a fun audiobook to listen to, made more so by Tim Gerard Reynolds' narration portraying events from the perspective of the prince, Jalan, but the actual storyline is also fairly linear. These two interesting characters travel from location A to B to C gaining knowledge in a traditional questing format. The people the prince and viking meet and places they go seem secondary to the way the main characters react to them. In the end this book is recommended to people who enjoy a story that focuses more on contrasting characters and their personalities than the complexities of the events within it. It's also fairly funny for those who like a good dose of humor injected into darker fantasy elements that include undead creatures. If you could sum up Prince of Fools in three words, what would they be? It caught me from the first with it's sense of humor, and kept me going with a delicious lead character and his un-looked-for side-kick. I wish there were more in this series. What other book might you compare Prince of Fools to and why? Flashman, very tongue-in-cheek, clever, witty, with a strong plot and interesting settings. There were too many to single one out. Yes, and I did listen very quickly, and wished there was a volume II. Very unlike his Prince of Thorns. Prince Jalan and the viking Snorri, unlikely companions, become entangled through sorcery. In their quest to rid themselves of one another, a remarkable thing happens. A friendship blossoms. Oh, and there's also a great fantasy plot to boot. Not quite as "grim-dark" as "Prince of Thorns", "Prince of Fools" was still edgy and perhaps more humorous than its predecessor - at least that was my take. Both series are redirecting the genre into less explored regions. To say they are "refreshing" is an understatement. Buy these audiobooks! The narrations are superb and even if they aren't your cup of tea, they will leave a lasting impression. Jalan, of course. Though Snorri was quite fantastic as well. I laughed a lot. Our anti-hero is not as dark as the Prince of Thorns, though he still has his edges. Wow! Awesome! Well done Mark Lawrence! You did it again! Jalan. Jorg. Both stand firm in their own characters. One a coward the other callous. Both heroes? Or something else. I actually didn't like British voices as readers until I heard Tim Gerard Reynolds read the Riyria series. I picked this book because of Mr. Reynolds is that fantastic reader I love to hear. My problem with this book is Mark Lawrence's writing about this character. I think he is a decent writer, I just hate this character. I find him disgusting and loathsome. Maybe that is what Mr. Lawrence is going for. Maybe he has just done too good a job at making me hate this lead character? I dislike this prince so much, I don't want to hear anything more about him. In the Riyria series, which I feel is a worthy comparison, Michael J. Sullivan writes about characters I enjoy. They are "anti-heros" I feel I can get behind. I likely won't finish this book. If you are one of the ones who liked this book far better than I, I judge you not. This is just not a book for me. Yes, I LOVED the Riyria Chronicles and Revelations and he did an amazing job on those as well as this book. I laughed out loud through the whole book. The writing is very clever and wonderfully written, full of wit. This book is action packed and even though the main character is basically a D-bag (albeit a very funny one)... you end up rooting for him to pull through. And he usually does. 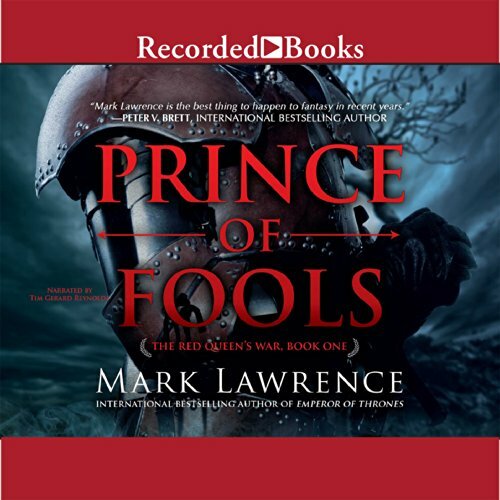 Prince of Fools by Mark Lawrence is a very interesting and exciting read. Unfortunately, I read the Broken Empire trilogy before i read this book. The problem is that The broken Empire trilogy is in my opinion one of the best fantasy series I have ever read. This book is very good and is by all means worth reading. It contains Lawrence's usual deep and well thought out characters and his magnificent story telling abilities. The simple problem is it is very difficult to make another character as good as Jorg from the previous trilogy. I really like the new main character Jalin, but he just doesn't fascinate and horrify you at the same time like Jorg did. Despite this problem the overall story was interesting and enjoyable to read. The narrator in my opinion did a fairly good job with the story, although all the vikings seemed to sound the same to me. As a whole, i liked the story very much and fully intend to buy the next book, but don't be too disappointed if it isn't as good as Prince of Thorns. i give it 4 of 5 stars. What made the experience of listening to Prince of Fools the most enjoyable? I loved the humor in the book along with TG Reynolds. Reminds me a lot of the demon saga wars. The voices!! It made it worth listen to all on its on. Snarky Humor is the Best! Loved the overall plot design and writing style. A smidge too much undead for me, but that's my problem. I found the character development of the two main characters to be be excellent and believable. For me, Jalan's snarky humor and Snorri's steadfast honor made it perfect! Tim Gerard Reynolds may be my all-time favorite narrator, which is how I found this series when I was mourning having read every Ryira story available. This is my first Mark Lawrence book- I just wasn't able to engage with the way the first "Broken Empire" trilogy was narrated, so I'll have to go back and read those with my eyes. ;-) I didn't feel like I was missing anything reading "Prince of Fools" first, though, and I'm excited to listen to "Liar's Key"!